I can start celebrating my birthday today (Tuesday in Dallas) and again tomorrow!! , Wolf! I HOWWWWWWWWWWWWWL my good wishes to you! 2:10. Happy Birthdays, Wolf and Good Morning everyone. Make a wish & blow your candles out! May your 'two days' be filled with good wishes! Will have to make my own sunshine! I think you ARE a breath of sunshine, Shiela - and good morning all! Wendy for the beautiful bright sunset. Morning all, I wonder if the fishermen in the photo caught anything. Wolf, enjoy your two day celebrations. I might as well do the dirty deed. Happy Birthday Wolf. May you enjoy many more. Hi Snobird, I did get your answers and sent you a reply. Did it go astray? all. Yes Wombat, it must be out in cyberspace somewhere. As most of you know, we head south in a week & 3 days. That means lots of last minute doctor, dental, chiropractic appointments etc. Our dental appointments were today and the bad/sad news is I have to go early tomorrow morning for a ROOT CANAL!! My apologies Jim, I did get your message. Usually I get an e-mail notice, but not this time for some reason. I just checked my inbox on this site & there was your note. Thanks! Broome, my wife's favourite place in the whole world. She loves to sit outside the Sunset Bar at Cable Beach and watch the sun go down over the ocean whilst the camel trains walk off the beach on their way home. Some beautiful sights in the surrounding countryside as well. 2:04 Good morning one and all! It is lovely at Broome, on the beach watching the camels arrive. I didn't have a ride but it was lovely watching others riding them. The sunsets are really spectacular. 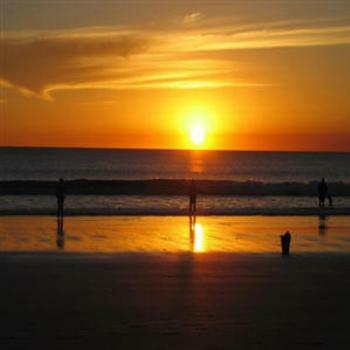 I do have two photos in My Gallery of Broome sunsets but not very spectacular. Also, they are quite a way down in my many photos. I had my broom stolen at Broome! Forgot where you parked it, did you Broni?